What The Hell Was Nick Saban Thinking With That Fake Field Goal? After spotting Clemson a 15-point lead at the half, Alabama slowly moved the ball down the field on their first possession of the third quarter, taking 12 plays to get to a pivotal fourth-and-6 from the Clemson 22. 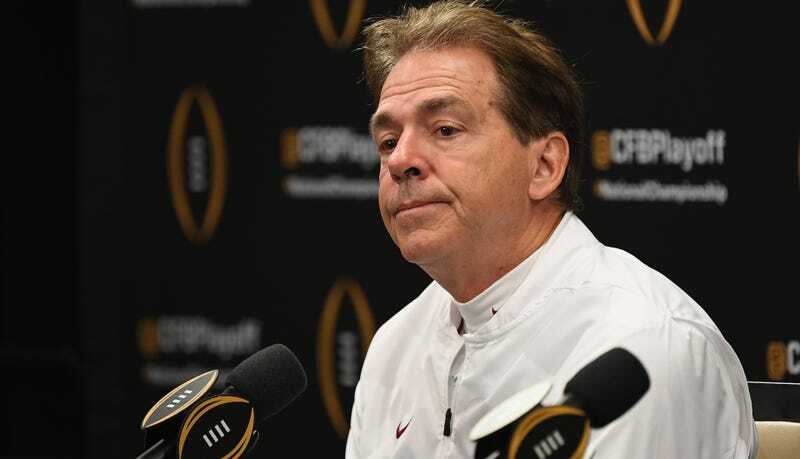 Bama’s kicker had doinked an extra point in the first half, so Nick Saban faced the difficult choice of either letting him try a 39-yarder or trusting his offense, which had already converted three fourth downs, to move the ball six yards. Instead, Saban kind of chose neither, offering up third-string QB Mac Jones as a sacrifice in the saddest and most predictable fake FG I’ve seen in a while. You’ll notice that Clemson is lined up in a standard defensive setup, with four linemen and seven linebackers and defensive backs. They completely saw this coming, and poor Jones never stood a chance of actually getting past the vaunted Clemson defensive line. Not only was Alabama unlikely to trust kicker Joseph Bulovas, a successful field goal would still have left the Crimson Tide in a 12-point hole, still needing two touchdowns. Three plays after the botched fake, Justyn Ross slammed the door shut. Alabama had four drives in the second half, and aside from an utterly futile Jalen Hurts–led three-and-out at the start of the fourth quarter, they all ended in turnovers on downs deep in Clemson territory. There was the aforementioned fake field goal, and Tua Tagovailoa also got stuffed on a pair of rushing attempts. Here is the first, where he got smacked trying to get a fourth-and-4 from the Clemson 14. Unlike that run, which came as a result of a broken play, Alabama’s final fourth down attempt seemed like just an ill-advised play call. Facing fourth-and-goal from the two-yard line, Tagovailoa—at that point banged up and sad—got dropped for a seven-yard loss by a Clemson defense that wasn’t confused by anything Alabama was throwing at them.